21. With a very sharp knife, lightly score the skin side of each filet. This prevents the skin from contracting while grilling. 32. Coat filets with vegetable oil and chopped fresh thyme and refrigerate. 51. Remove excess liquid from tomatoes. 62. In a sautée pan, sweat the onions, shallots, and garlic in the oil until soft. 84. Cook on low heat until all excess liquid evaporates. Taste and adjust seasoning. 101. Finely chop or lightly process mushrooms. 112. Sweat the shallots in the butter for 5 minutes then add the chopped mushrooms and a quarter teaspoon of lemon juice. 123. Cook mushrooms until liquid has evaporated. Adjust seasoning. 134. Blanche the vegetables in simmering, salted water. Reserve. 151. Place the fish, skin side down, on very hot land or oiled grill to sear lightly. The purpose of this step is not to cook it, but to lightly flavor it and give it decorative grill marks. 213. Place the filet on top, skin side up. 224. Place vegetables garniture on top of the filet, side by side, carrots in middle, about 1.5 tablespoons in each pile along with a sprig of thyme and and a few small splashes of white wine. 235. Brush the edges of the parchment with lightly beaten egg white, fold the paper heart in half and press the edges together to seal. Brush the edges of the folded package with egg white. Make a series of short folds along the edges. If desired, you may brush it again with egg white and repeat the folds. Using a pastry brush, very lightly oil the top of the Papillote. 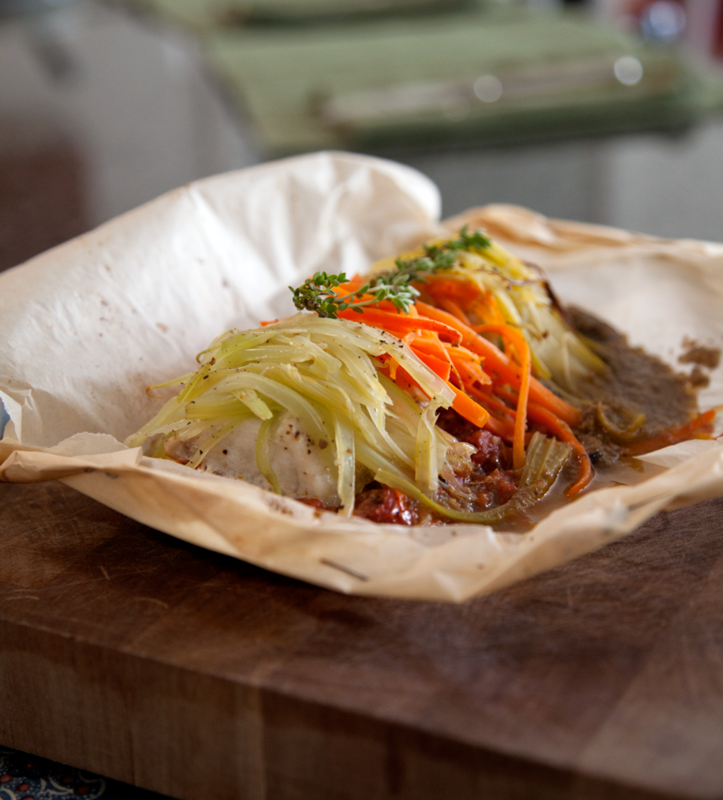 25You may seal the Papillote using the same process but with the help of a stapler. 27usually done when completely puffed, about 7 to 8 minutes, depending on thicknes of fish.